Potatoes are so versatile! There is so much you can do with a potato and so many ways to cook them. From Potato Salad to Potato Wedges to our incredible Stuffed Sweet Potatoes and many more, find the perfect potato recipe! Start putting some adventure back into your meals with our awesome potato recipes! The delicious and comforting combination of leek and potato make up these pancakes for a hearty breakfast that will keep you going until lunch. You can make them ahead of time too, and freeze them, for a healthy breakfast in minutes. The sun is going to be shining this weekend and we are celebrating that by turning up the heat (get it?) 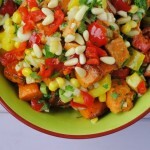 on the BBQ themed recipes, starting with this not so typical Roasted Sweet Potato Salad. 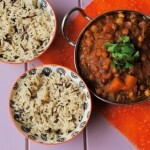 Put your slow cooker to work on Friday night takeaway night and make a delicious vegan Sweet Potato and Chickpea Curry in it. 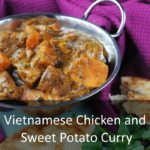 It only takes 5 minutes to prepare, so with a bit of forward planning it can be easier than calling for a curry to be delivered. 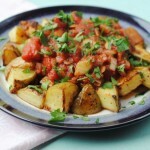 There is so much that you can do with potatoes as a side dish and Patatas Bravas is a traditional Spanish side dish that is perfect for tapas night. Crispy potatoes and a spicy and smokey sauce on top. If I had to choose my favourite food to eat, sweet potato fries would be high on the list. Make them lighter by cooking them in the oven with this fool-proof method.